Deborah Springhorn, a teacher at Lebanon High School, Lebanon, NH, spent a year creating an interdisciplinary global issues course while on a Christa McAuliffe Sabbatical (sponsored by NH Charitable Foundation). For 30 years I have lamented the lack of time to teach the current global situation in the context of a world history course that is supposed to go from the prehistoric to the present in one year! Given the global paradigm shift after the fall of the Berlin Wall and the rapid shift again after 9-11, it has become even more imperative to prepare students for global citizenship by developing their understanding of complex global issues and instilling the disposition to see others as they see themselves. The goal in developing the course, Global Issues Since the Fall of the Wall, was to create an interdisciplinary, common core based course that would be a model for high school teachers to adopt in its entirety or adapt from to fit their own curriculum. Ideally, the web site on which this course is published [http://www.teachingforglobalcitizenship.org] will become a vehicle for dialogue about resources and lessons that are as dynamic as the global situation, accommodating the rapidly changing issues and conflicts as they arise. Now more than ever, teachers need to provide context and understanding of the world in which we live so that future citizens will be able to grapple with the complexity of the issues which face us. Having taught in four schools in four states over the past 30 years, I have found it increasingly problematic that most high school programs of study spend so little time on the current global situation. American history courses seem to struggle to get past Vietnam; world history courses seem lucky to get to the Cold War. Yet, how can we expect our future citizens to make intelligent voting decisions, let alone survive in a world that is now so interconnected, when they have virtually no understanding of contemporary global events? Including currents events when there is time does not sufficiently allow for teaching the complexity of the challenges that face us now. The web site for the course has unit overviews, detailed day-by-day plans, resource links, and annotated bibliographies of all the sources used for each of the units. There is an overview for each unit as well as a calendar view that shows the homework to be assigned prior to the next day’s plan. All of the materials such as project descriptions, writing prompts, assignments, discussion questions, reading guides, quizzes, tests, and rubrics have already been written for the curriculum and will be available to any teacher who wants them. This course, focused on the global community since the end of the Cold War, is organized, in part, around the photojournalism of James Nachtwey, the preeminent war photographer of our time [http://www.jamesnachtwey.com]. The photographs he has taken throughout his career of the last 40 years have had immediate and lasting impact. His cover story in The New York Times Magazine focused attention on the humanitarian crisis in Somalia that had been largely ignored by mainstream media. 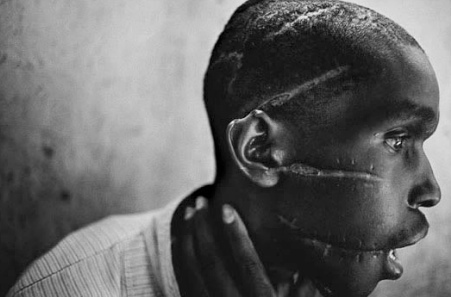 His photographs of the horrors in Rwanda helped put a human face on a tragedy so many were unwilling to call genocide. •	make constant connections among disciplines. •	teach contemporary history, the umbrella discipline and as a narrative. •	assume students want to be knowledgeable about the world. •	set high expectations and help students achieve them. Given the provocative subject matter of the course, compelling questions will be raised that will require research and analysis, fostering a multitude of information literacy and critical thinking skills. The multiple perspectives inherent in discussion of these topics will sharpen presentation, discussion, and leadership skills. Therefore, everything connected to this course, such as the reading materials, activities, assignments, and assessments, will all reflect the Common Core Standards, particularly those for History/Social Studies and Language Arts. Higher order thinking skills are intrinsic to the interdisciplinary design of the course because students are always making connections among the different disciplines that come together in each unit. In the second unit, for example, students examine the events that brought about U.S. intervention in southwest Asia after the 9-11 attacks. The essential question for the unit is how our strategies in Afghanistan, Iraq, and Pakistan are all related. To answer this multiple disciplines are used, starting with art and an examination of some of Nachtwey’s images. While reading articles from contemporary news sources such as Foreign Affairs, The Economist, The Guardian, and The New York Times, students will be reading one of Khaled Hosseini novels, either The Kite Runner or A Thousand Splendid Suns as well as Mohsin Hamid’s The Reluctant Fundamentalist. As students process the every day challenges faced by the characters in the novels, they will develop greater insight into the lives of actual people in the region. Similar to the other units, this one includes materials and lessons developed by the CHOICES Program at Brown University [http://www.choices.edu]. “Teaching with the News” lessons on “The Costs” of War” and “Debating U.S. Drone Policy” build on assignments from the news journals. The unit includes the CHOICES Options Role Play Discussion that looks to the challenges that will continue to dominate our interests in Afghanistan. This will be followed by the culminating exercise of a research paper designed to pull together all they have read, researched, and discussed into a cogent essay that reflects their assertion for the best option for our continued foreign policies in this region. This will require students to look at our strategies in Afghanistan, Iraq, and Pakistan comprehensively and determine the values that would underscore a consistent approach to all three countries. All of the critical reading and thinking skills, as well as the information literacy, presentation, and writing skills will culminate in the last unit when students will get the chance to develop their own expertise around a particular global issue or conflict. After an introduction to the variety of global challenges that face us, the rest of the unit will be devoted to student research. Students will research and write a traditional college-style research paper. The expertise gained through this research and writing will then be reshaped into a TED Talk in which students will share their expertise in a ten-minute version of the model TED Talks they will have seen throughout the unit and the course. Simultaneously, we will be reading and discussing Thomas Friedman’s Hot, Flat, and Crowded as a way to frame the global challenges we face. For some applied practice in global citizenship, students will experience first hand the possibilities that exist for everyone to make a contribution to making our world a better place. Using funds gained through grants and donations, students will research KIVA loan applications [http://www.kiva.org]. They will advocate for different investments and decide collectively how many projects to fund with the money we have collected. Not only do we need to teach more about the global community in which we live, but we have to teach about it in a way that will foster 21st century skills and a disposition to care about being active global citizens. There can be nothing more important to the education of future global citizens than instilling the willingness to see others as they see themselves by provoking inquiry, engendering compassion, and inspiring change.